Embracing one’s inner carnivore is not an unusual thing to do in a city nicknamed “Cowtown,” but this was not your usual steak. It was pig head mortadella, a signature dish at the restaurant Charcut Roast House in downtown Calgary. I usually avoid foods with the word “head” in them, but they are a magnet for my husband, and this one had arrived with a plate of other house-cured meats, winning me over. Charcut does, of course, serve a straight up prime rib — this is still Cowtown — but there are no sides of iceberg lettuce or creamed spinach. Instead, I had the crunchy duck-fat-fried brussels sprouts. 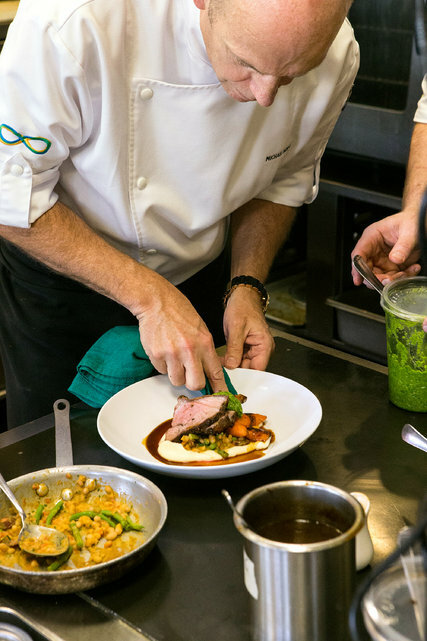 The growing sophistication that has given rise to restaurants like Charcut is part of a broader cultural evolution taking place in Calgary. Long treated as a pit stop en route to the Rockies, the city may be best known to outsiders for hosting a colossal cattle-centric bacchanal, the Calgary Stampede. But if some still think of the stretch from the Pacific to Toronto as flyover land, the smoke signals emanating from the city are inescapable. There must be a reason that Calgary kept landing on those best-cities lists; that it was growing at more than double the rate of Montreal, Toronto or Vancouver (by 10 percent from 2008 to 2013); and that ­people I met who lived or had lived in the city spoke of it with such affection. There are many reasons, as I learned on a September trip during which I ate fine and original food, strolled the river paths, visited vibrant boutiques and art galleries, and talked to whatever locals I could corral, which was easy as they are a notably friendly lot. I found a city where a combination of petrodollars and enterprising locals are fueling a creative transformation. “Calgary is underestimated in terms of the culture,” said Viviane Mehr, managing director of Barbara Edwards Contemporary, an art gallery she opened last year as the second location of a Toronto venue. She had held seven openings in her first 12 months, every one of them packed. “The morning after the first show we had to touch up the walls, so many people were leaning on them,” she said. When I visited, the gallery was showing the internationally acclaimed South African artist William Kentridge, but it is also bullish on young talent, much of it local. Tara Westermann, the gallery’s associate director, mounts regular scouting trips to nearby Alberta College of Art and Design. Ms. Westermann, 26, was recently the valedictorian of her master’s degree class at the Sotheby’s Institute of Art in New York. Given the opportunity to help open the new Calgary gallery, the Toronto native moved to the city sight unseen. But why leave when there is so much oil money sloshing around, looking for somewhere to put itself? The arts, like every other sector in Calgary, are intimately tied to the city’s dominant economic force. One night we walked around and inside the irresistible Jaume Plensa sculpture “Wonderland,” a 39-foot-tall female head made of bent wire that is steel-strong; it resembles a giant hologram of white mesh. 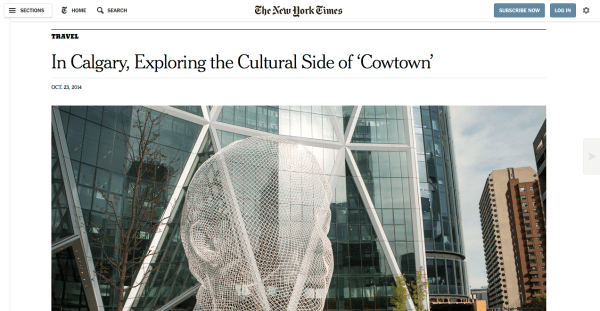 It was commissioned not by the city, but by the Canadian energy giants Encana and Cenovus, who are headquartered in the Foster and Partners-designed Bow Tower, a 58-story gleaming half pipe that opened in 2013 and whose plaza is the sculpture’s home. The sculpture and building are in downtown Calgary, a place of young men in good suits, grand old banks repurposed as (mostly so-so) restaurants, and LEED-certified oil company headquarters. Things there are under enthusiastic construction: a new central library, a new National Music Center, a new riverbank neighborhood. And it’s also a place where black, white and iridescent blue magpies suddenly appear, nonchalant as pigeons, and where a human “Habitrail” of overhead glass walkways — at least 57 of them, 10 miles’ worth — foretell the long and frigid winter. But the city is by no means all corporations and concrete. Beyond the towers and tubes, three of Calgary’s most vibrant neighborhoods — Inglewood, Kensington and 17th Avenue SW — form a constellation around downtown, from where they can be reached by ambitious pedestrians or on easy-to-navigate public transportation. 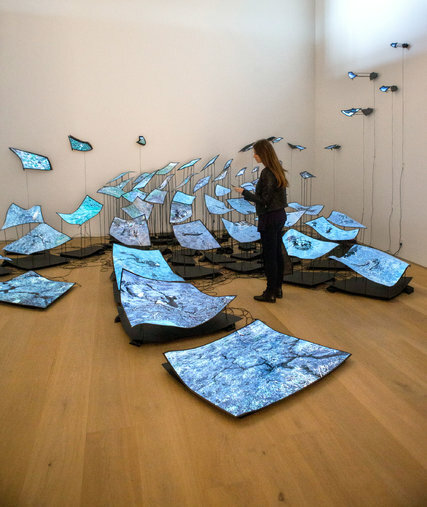 From Espy it would have been just a few steps to the two-year-old Esker Foundation, a privately funded, 13,000-square-foot gallery that Ms. Mehr said was the best contemporary art exhibitor in the city. (Others might point downtown to the long-established Glenbow Museum, which has the largest art collection in Western Canada and a wealth of regional works.) Unfortunately the Esker Foundation was between its summer and fall shows, so I had to mark it for a return visit. I didn’t have to wander far down Ninth Avenue SW, though, before stumbling upon DaDe Art and Design Lab. It was setting up for an opening featuring the work of Darcy Lundgren, who covers large surfaces with shredded recycled paper and splashes them with paint, suggesting vertical lawns that invite the viewer to touch. An art gallery, furniture store and design company sprawled over 3,000 square feet in what appeared to be a chic garage, DaDe shows off local and international artists. The real beauty of Kensington was the view from the foot of 10th Street NW, looking across the Bow River to a city skyline that served as a backdrop for fishermen and rafters enjoying the last days of summer. From Kensington we walked east along the river, passing cyclists and runners, until we arrived at the pedestrian Peace Bridge, designed by the Spanish architect Santiago Calatrava and unveiled in 2012. 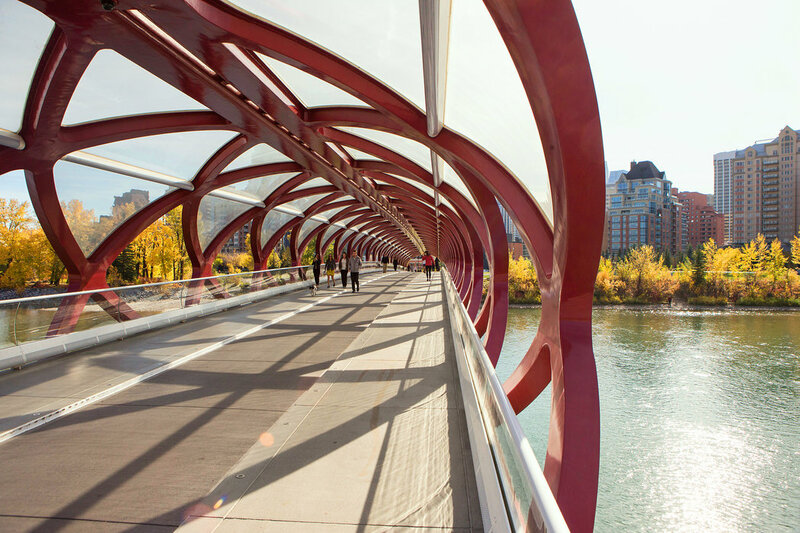 Most of his bridges and buildings around the world come in sleek whites and grays; in Calgary, he decided to go with bright red. If it looks like a futuristic spear zooming right at the heart of city, the artistic departure befits a place that generates its own heat. The next day I walked the length of 17th Avenue SW, where residents in sunglasses lounged on restaurant patios chasing brunch with beer, or stood in line for poutine, the Quebec dish of fries, curds and gravy that has broadened its reach across the nation. I walked onward to a nearby cafe to meet up with Greg Clark, 43, a politician whom I had met via four degrees of separation. I was hoping he would identify some essential Calgary-ness for me, explaining the city’s bursting growth and increasing polish. Book hotels up to a year in advance if visiting during the Calgary Stampede in July. Inglewood Bed and Breakfast (1006 Eighth Avenue SE; 403-262-6570; inglewoodbedandbreakfast.com) is a block from shop-lined Ninth Avenue SE and next to the Bow River path, which offers easy access to other neighborhoods. Rooms from 100 Canadian dollars, about the same in U.S. dollars. The year-old Kensington Riverside Inn (1126 Memorial Drive NW; 403-228-4442; kensingtonriversideinn­.com) offers 19 stylish rooms. From 219 dollars for a double. Hôtel Le Germain Calgary (899 Centre Street SW; 403-264-8990; germaincalgary .com) is downtown and is part of a Montreal-based luxury group. From 279 dollars for a double. Charcut Roast House, 899 Centre Street SW; 403-984-2180; charcut­.com. Notable, 4611 Bowness Road NW; 403-288-4372; notabletherestaurant­.ca. Roasterie, 314 10th Street NW; 403-270-3044; roasterie­.com. Barbara Edwards Contemporary, 1114 11th Street SW; 587-349-2014; becontemporary­.com. DaDe Art and Design Lab, 1327 Ninth Avenue SE; 403-454-0243; dadegallery­.com. Esker Foundation, fourth floor, 1011 Ninth Avenue SE; 403-930-2490; eskerfoundation­.com. The Glenbow Museum, 130 Ninth Ave SE; 403-268-4100; glenbow­.org.